Without question, reproducibly, and significantly, adding dried dragon fruit (specifically I buy Trader Joe's dried dragon fruit) to a meal makes a difference in my type 2 diabetes glucose level control after this meal. The chart shown above plots the results of adding Trader Joe's dried dragon fruit to a dragon fruit diabetes diet salad based meal which I regularly have as my first meal of the day. I kept my activities pre and post meals the same for all the meals, and I kept my other meals the same and exercise levels similar to make the test meal variables to a minimum. 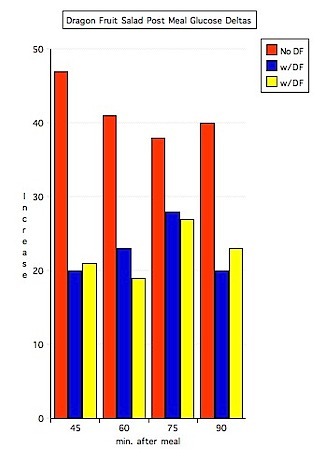 I used 45 grams (about 1.5 oz) of Trader Joe's dried dragon fruit for the two meals (yellow and blue bars on chart). In the meal without the dried pitahaya fruit added 45 grams of mixed dried fruits were added as a substitute for the dried pitaya fruit carbohydrate load in the meal. The vertical axis shows the increase in blood glucose level from the fasting level (before the start of the meal, which was the first meal of the day). The horizontal axis shows minutes after the start of eating. For example, the first group of 3 bars on the dragon fruit diet diabetes chart represent the increase in blood glucose level for 45 minutes after the start of eating for the meal without Trader Joe's dried dragon fruit added (red bar) and for meal A (blue) and meal B (yellow) with Trader Joe's dried dragon fruit added. The meal with no dried pitahaya fruit added showed an increase of 47 from fasting. Meal A showed 20. Meal B showed 21. The meal is the Dragon Fruit Diabetes Diet Salad described at this website. Results similar to this are reproducible and reliable for me with this meal. I have not explored adding dried pitahaya fruit to other meals. I will go into more detail in the future. I will also go into more detail about the diabetic food testing methodology I use for experiments like this one. It is not hard to do yourself. Measuring Blood Glucose Results / Blood Glucose Meters Used: To record blood glucose level results I use either the Lifescan OneTouch Ultra Blood Glucose or the EasyGluco Glucose Monitor which uses less expensive test strips but takes a bit more blood and time to measure. Both are reliable and accurate.